To make a point when other methods failed her. Biographers since then have asked what ailed her. Drawn by those (mainly men) who write our histories. Of trite one-sided tales and other mysteries? Even to those of us who like our whiskey. And her mode of expression grew more risky. When silenced, we resort to hatchetation. 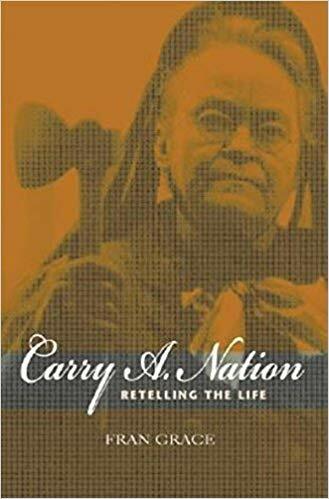 *context: highly recommend this fascinating biography of Nation, which offers an interpretation of Nation’s life that avoids both rose-tinted glasses and jumping to insanity conclusions. I was 6 years old when my parents and I went to their friends the Carrigans’ house in Albuquerque to watch The Princess Bride together. Their daughter Ali was about 7, and scared the sh*t out of me. It also scared the sh*t out of me when Inigo got his face cut with a sword in his fight with Wesley early on in the movie. I freaked the f**k out and refused to watch any more. So, Mom & Dad put me to bed in Ali’s bedroom. I knew the plan was for me to sleep over but I was having none of it. Pretty sure I threw a monumental tantrum. Buuuuut then I fell asleep before they were done watching the movie, and when I woke up, it was the middle of the night, and my parents were gone, and I wasn’t sure where I was. I freaked the f**k out all over again, woke up the entire household, and the Carrigans called my parents (who were just a few minutes away at my Aunt & Uncle’s), who came to pick me up. I was safe in a comfortable home with people I knew and that I knew my parents trusted, and my disoriented terror lasted 15 minutes, tops, before my beleaguered parents came to retrieve me. And it’s still one of the most vivid memories from my childhood. Border security is a real concern where I’m from, where ranchers live off the land on the thinnest of profit margins. It’s not a matter of if the borders should be protected but how. But there MUST be a way to meet those needs that doesn’t involve terrorizing thousands of children in ways that are exponentially more horrible than my little Princess Bride/anti-sleepover episode. I can laugh now at ROUS’s and the Pit of Despair and the brilliantly silly dialogue. I’ve never had to run for my life; my father has not been slaughtered by a six-fingered man or drug cartel boss. I can’t laugh at the desperation of a family that would cause them to flee their homeland, nor the horror of being ripped from one another when they went to the wrong checkpoint to seek asylum. And I hope I never can. I loved this sculpture largely because it's called a "fountain." This is the correct way to have a decorative fountain in the desert. …the final frontier. 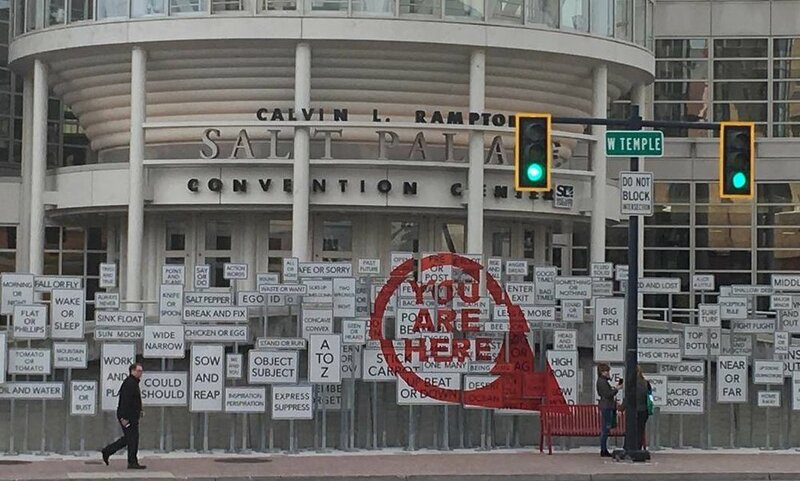 Or, the sense you get when walking several blocks in Salt Lake City. Everything is just so wide here, and the blocks are 1/8 of a mile, rather than about 1/20 of a mile as the street blocks are in Manhattan. Wide enough to turn an ox-driven wagon, I overheard someone say. I would verify this information on the internet, but the hotel wifi is not working at the moment and I’m hoping to limit my phone bill to just one data overage charge this month — tour life, amIrite? — and anyway Trump is still president so who cares about pesky little things like facts. Suffice to say, space is at the opposite of a premium in this part of the country. As a born & bred Southwesterner, this kind of space hits me on a mitochondrial level. I’ve been to Salt Lake twice before, once stopping for lunch on a road trip right after highs school and once for an academic conference in college, and didn’t realize, having never lived outside the Southwest at that point, how much like home it would feel. But as the flight from Portland began its descent and I watched the expanse of arid, mountainous, low-population-density land come into sharper focus, I was filled with a deep sense of familiarity. This was like home, but a little less Mexican and a little more Mormon. Lots more thoughts on all of the above, but will save for another time. The King’s English independent bookshop! Can’t say enough great things about this place. In Seattle I knew about Elliot Bay Book Co and in Portland of course was Powell’s, but I had to do some research. (Backstory: I have a goal of visiting an indie bookstore in every city and buying at least one book by a local author.) I liked the name of the shop, then saw on the website they had a local author event on our first Tuesday in town, and we didn’t have a Tuesday night show because of the travel distance from Portland. Perfect! The visit and reading the memoir was definitely a highlight of our time in Salt Lake. I love books, and I love small local businesses that provide nourishment to the community that in turn sustains them. Win win! 2. Organ concert at the Tabernacle. My Dad would love this. I love imagining what it would be like to hear a pipe organ before electronic amplification. 3. Red Butte Gardens — nice for varying levels of physical exertion: stay on the level paths thru the botanical gardens, or hike one of the trails that shoot off from the main gardens. Beautiful. I hiked for about an hour and a half, restored my rugged New Mexican soul, then ubered back to the hotel, ordered room service, and restored my privileged urbanite body. Gemini much? 4. Red Iguana, family-run Mexican restaurant; for quick & easy, Taste of Red Iguana at the City Creek Mall. Comfort food for Kat! I told myself I wasn’t allowed to eat there every day, so I only ended up going there like 5 or 6 times. 2 meals worth of food for about $8. 5. Cupla Coffee — just opened recently. Great coffee, friendly owners, yummy breakfast burritos! If Romy & Michele were twin sisters, and were into coffee instead of design, this would be their shop. It was my favorite treat breakfast. When I was living in New York and having a bad NYC day/month/year as periodically happens, Portland is where I would threaten to move. Dreams of going “where young people go to retire,” etc. Instead I landed a great opportunity a couple hundred miles north in Seattle in 2014, and spent over three years working at the 5th Avenue Theatre. I was looking forward to getting to finally spend a few weeks in my would-be place of youthful retirement on this tour, having only made it to Portland once for a weekend right after I moved to Seattle. The tour opened (conveniently for me) in Seattle and next stop was Portland. My college bestie, Erin, lives in Seattle and was able to take the travel Monday off and drive me down to Portland, where I’d be staying with my friends Christi and Grayson and their dog Rio for the three weeks we were there. Friends, check; kitchen, check; furry pal, check — an easy, gradual transition to really being on the road. My first visceral feeling that “I’m really on tour now!” came when we stopped for donuts in Tacoma. I’m not a great gift-giver — birthdays and holidays stress me out — but the one git-giving tradition I get into is the Japanese one of bringing omiyage to friends and hosts when traveling. My mole in New York (my dear friend Kurt, Christi’s brother) had told me some of Chrsiti & Grayson’s favorite treats, including that Grayson is coocoo for donuts. I’d meant to swing by a spot in my neighborhood in Seattle, but in the chaos of packing up my life and saying “hasta!” to my cat et al, we were already several miles south on I-5 when I remembered. Erin took us to Legendary Doughnuts in Tacoma, where after being paralyzed by the number of options (sizes, flavors of donuts! ), I ended up getting one of each flavor of doughnut balls for Grayson and same for the Hamilton band, and a treat for the road for Erin & me (Erin chose the “Conan the Bavarian”). They were a hit! the wall of sound from 3,000 people cheering the show at Keller auditorium was incredible! Wildfang - discovered when our dance supervisor Kourtni was wearing a really cool button down shirt from them and I gave her a compliment. Portland-based, “female founded, women run” - just expanded to SoHo and soon to LA, but I feel like a hipster because I bought a blazer and several other things there before they had stores anywhere but Portland. I narrowly escaped with most of my bank account. Love what they stand for and support, and have bought some gifts there since. 3. Thriving tech industry notwithstanding, Portland is a beautiful city with lots of nature, and we were lucky enough to be there during cherry blossom time. Loved the view of the cherry trees on the waterfront as rode to work, as well as the big tree out front of the house where I was staying. 4. When my personal keyboard showed up with two broken keys, Inner Sound in Clackamas repaired it overnight, and advised me how better to pack it, and what to look for in purchasing a new one should the key weights/suspension simply not be able to cope with the bumps of travel (so far so good). 5. One thing I love about touring is getting to meet up with friends and acquaintances I mightn’t otherwise see. In addition to getting to spend some time with Christi and Grayson, I got to meet up with my sound designer friend Justin, who popped down from Seattle where he was doing a show, and my new friend Flint, another pianist-conductor I’ve been hearing about for years who happened to be in town and found me by the pit when he came to the show. Yay new friends! Q Restaurant and Bar provided great food and drink for hanging out and catching up with each of them (…admittedly I’d have gone back alone had I not had a friend to take). Thanks Flint for finding me and introducing me to that delicious place! I actually got sick in Portland, so spent a disproportionate amount of time huddled in the lovely basement space sleeping/watching Star Trek: Voyager. But it was nice to be huddled in a home with friends and not in a hotel. Left much to explore in Portland: my visit to Powell’s City of Books was perfunctory (just long enough to grab The Left Hand of Darkness and The Authenticity Experiment, and Cannon Beach will have to remain on the “someday wanna go” list. Til next time, Portland! Latoya and I used to work together at a wonderful community music school on the east side of Manhattan, Turtle Bay Music School. In between lessons and recitals, we bonded over our mutual interest in dance and science as well as music, and occasionally plotted our alternative bright futures as financial planners for artists (which neither of us ended up doing, but someone else did). When we spoke back in November, Latoya was preparing to start a new job, working in environmental education for an environmental protection agency, giving tours of a waste water treatment plant and developing curriculum and education programming around watershed protection and stewardship. Latoya is currently into Olympic lifting and crossfit, both of which made me feel fitter just hearing her talk about it. We talked about fitness, bodies changing as we get older, our reactions to the election, and Neil DeGrasse Tyson (not necessarily in that order). For math & physics, Quanta Magazine. For cutting edge research, New Scientist. Generally Scientific American and National Geographic are good. For mainstream news sources – well, the trouble with science news in mainstream news sources is that they take the latest study and base the analysis on just that, not on scientific consensus, not on the pattern of research. News sources no longer have dedicated science journalists, so there’s less questioning and analysis of what it is they’re reporting. I envision a place in which everyone has not only the right but the environment to be who they are. Where variation from the white hetero male “norm” is accepted. Where it’s not so surprising that someone who looks like me [Latoya is African American] can be interested in physics and math. For instance – [among African American women] straightening your hair was – is - a survival tactic – if you go into a job interview with straightened hair, you have a better chance of getting hired, because you look more Caucasian than with natural hair. America should be a place where we’re encouraged to be who we are, whatever way, shape or form, as long as it doesn’t impede on anyone else being who they are. How to work toward that vision? One of the difficulties with current civil rights activism is that there’s a lot of nostalgia, people always looking for the “next Civil Rights movement.” Back then the focus was on changing legislation – striking down segregation, fighting for voting rights, women’s rights. Now it seems the goals aren’t as clear and specific and it’s harder to galvanize a movement. I think in order for there to be progress, people need to put their/our egos aside to take in what the other person is saying. It’s always a bit scary to have a conversation with someone whose politics aren’t congruent with your own, and more so when that someone is a dear, longtime friend. When we were setting up a phone date via messenger, he warned me that he didn’t want to talk about politics, and he reserved the right to bow out of the conversation if it became heated; we’re old friends and he doesn’t want to soil our friendship. Understood, gulp – no more do I. Our call was delayed by a few minutes because his name came up for random drug testing at work. Having worked in the family business for years, he’s learned all the practical aspects of the work, and is now being groomed to take over the company in a few years. There’s a lot to learn on the business side that you don’t learn out in the field, he said. Boy, can I relate; the things I’m responsible for at work right now are not things they teach in music school. We ended up talking for a half hour longer than intended, and one of the first things he brought up was journalism, describing a 101-level exercise of turning a thousand words into two hundred without losing any critical content. I’ll try to do the same with our conversation. And, for extra credit, I’ll do my best to distill an hourlong conversation into a 10-minute read without misrepresenting him – which apparently was not a requirement of the journalism assignment. The question I ask everybody: What’s your vision for America? Well – I’ve yet to meet someone that wants bad things for America. The president – he – or she – may carry more weight than maybe a janitor, but they’re still a single person, and politics are so very meaningless in so many senses. I enjoy the spectacle of watching it. Now there’s a lot of hysteria on your [left] side of politics. Eight years ago, people [on the right] were just as convinced that we were going to go down the road to ruin. The best gun salesman in three hundred years has been Barack Obama. The former president and the current one bear similarities if you know where to look for them – they both have complete control of the narrative in their own way, for instance – but their styles also seem so contrasted. I think there’s a lot of sensationalism because the change in styles is abrupt, and because news is entertainment now. Media is ultimately a product, it has to sell, has to get the clicks. President Trump is lacking in some of the decorum and customs that it has been decided are part of decorum on the world stage…but I wouldn’t put him in with Kim Jong-Un; he’s not threatening to blow up a missile test and then failing; BUT he doesn’t follow the norms/rules of international decorum on the world stage. He’s certainly effective in controlling narrative. Maybe it’s his perception [as a businessman] that he has to control the narrative, because no one else is going to give that to him…I don’t know. I do worry about the immigration thing. I employ a bunch of immigrants who’ve worked very hard to obtain legal status…have families in Mexico, go back & forth. Maybe it’s because we’re scrupulous in our hiring practices, check I-9 status, etc, that we get this type of people, but these people have a very strong desire to comply with the law. I don’t want them to not be able to take care of family, not be able to visit their dying mother – like I have one employee right now who is – I don’t want him to have trouble coming back across the border to come back to job that he’s good at. I have a lot of compassion for the refugees and their difficulties. I never want my family to go through anything like that. I don’t want anyone to go through that. But I’ll tell you a story. It’s a true story of economics; it’s also true for a lot of things in life. So: there was a malaria problem in Africa, and people with good intentions tried to solve it by giving away mosquito nets. The malaria actually got worse. Why??? When they went and looked, no one was using the nets over the beds as intended. They were using the nets for fishing, other household activities. So they decided, we’re going to charge for the nets. Very, very little – like one or two cents a net, so it’s not so prohibitive to the people who need them. Now the nets had value to the people who were going to benefit. They were used for their intended purpose, and malaria rates went down. My point is, Americans have to value themselves. We have several mutual friends in Australia. Dustin for instance went through an eight-month process to get a visa to Australia to get married. The same way, Americans have to value themselves, and not give it away for free. Ok, I hear your story, and I can corroborate it with stories of my own where people treat things with much more respect if they pay even a nominal fee than if they get them for free. However, if we’re applying this as an analogy to immigration, my understanding is that immigrants – particularly refugees from places like Syria – already undergo something like an 18-month to 2-year vetting process that includes health screenings, background and security checks, extensive interviews…what do you say to that? I don’t know. I would have to look into that. Listen, my hope if the current vetting proecess is determined to be strong enough is that we pass no new laws, that we would enforce the robust set of laws that exist. But Americans have to value themselves, and there are problems with immigrant crime near the border, mostly related to drug smuggling. For example, I know ranchers who have lost their herds, their livelihoods, when people cross the border illegally and cut their fences because they can’t be bothered to go around. So there are problems. …So there was previously a 20-year immigration ban, around the 1960s, and the first-generation immigrants who came in after that ban was lifted have a really hard time with people who come here now and don’t assimilate, who wish it was Mexico. Can you elaborate on what you mean by not assimilating? Do you mean not learning the language? What would you have them give up to assimilate, because I’m gonna go ahead and guess that you wouldn’t want to give up tacos. No, I don’t want to give up tacos, of course. People can bring their cuisines, their traditions, fine. Learning the language is important, sure. Getting out beyond your little circle, learning about America, the place you live. There needs to be fealty or loyalty to the country. I’m not going to say hateful things about my neighbor. If my neighbor is homosexual, or a different race, I don’t care, I’m going to love my neighbor. Why are we [universal we] so mad at each other for not adopting each other’s points of view? We are way more than the way the country is run. There needs to be civility, and enough of us that have the same idea of what it means to be American to have that happen – identity not a wedge, it’s glue. But it’s better for entertainment purposes, clickthrus, for there to be conflict. But there has to be some agreement on the minimum to be American – when national identity goes away, we struggle. I love you, Kat. My faith is more than my nationality, and my national identity is more than my politics. If I didn’t love you, I’d be a sorry example of my faith. Well, do you have enough for your project? Have I turned your stomach enough in the last hour and made you late for work? My friend is a very private person, and asked to be identified simply as an American citizen. I have been left considering my own thoughts on what it means to be an American citizen. What are the baseline values the vast, vast majority of us in all quadrants of the political map can swear fealty to? Can we get back to working toward a more perfect union – i.e. a civil and reasoned debate about how best to practice and uphold those values? What is each of our responsibility – what is my personal, daily responsibility – in working toward that more perfect union? Brandon and I have never actually met face-to-face. We know each other because he used to write and produce songs for the Songs of Love Foundation, a nonprofit that produces original, personalized songs, when I was the music coordinator. I finished working there in 2006, so it had been a minute, but Brandon and I have been connected on social media for a while, at that osmosis level where I have a very vague idea of what’s going on in his life and presumably vice versa. It was in fact a social media post and comment of Brandon and one of his friends that led to me choosing to start this We The People project. If you missed it, you can read about it here. Yeah, it was tricky figuring out how to pronounce those kids’ names sometimes, kids of family members; a lot of them were foreigners or had foreign names. It was nerve-wracking calling the family, because as soon as I’d say I was calling about the kid, they’d freak out, thinking something had gone wrong. ‘No, no…I’m just the songwriter!’ …Man, I always tried to make those songs just as cheerful as could be, for what those kids and families were going through. Working for a healthcare company, administering a Medicaid program. [Did Obamacare, or all the uncertainty about its future have any effect on the atmosphere at work right now?] …No, Obamacare didn’t affect it adversely, and right now there doesn’t seem to be too much uncertainty for my job. ARE YOU STILL WRITING MUSIC THESE DAYS? WHAT ELSE ARE YOU UP TO? I don’t have too much time to write music these days [raising 2 kids with his wife], but I do occasionally. In fact, I just put together a new computer, with Logic & a little studio. I’m working on an addition to the house – much needed. We’ve lived in the biggest tiny house for a long time. We’ll finally have enough bathrooms, and my kids are excited about having their own space. ARE YOU DOING THE CONSTRUCTION YOURSELF? ARE YOU GONNA PUT YOUR KIDS TO WORK? I’ll have framers help frame it, then after that I’ll insulate & add the sheetrock and do the floors. The kids aren’t quite big enough to be put to work, but they’ll help paint and pick out colors. They’re excited, we’re all excited. AND, THE QUESTION I ASK EVERYONE, WHAT’S YOUR VISION FOR AMERICA? A place where anyone can be what they want to be if they work hard for it. And I think it is getting better; I lived in a trailer park and didn’t have that much growing up. And I’ve had an African American woman supervisor. So I think things are getting better, and you can get ahead if you work hard. For my kids – to be what they want to be, sure. Right now, especially since the election, I’d be happy for them to get along with everyone. I want everyone to get along again. As I fly to our nation’s capital this post-election Veteran’s Day, I’m thinking my family and friends who have served in the military, and about how I personally can serve this country I love, these United States of America. Now: I’m gutted that Trump won, for reasons that I’m happy to go into when I’m not trying to make a different point. The biggest one, and the only one I’ll mention here is that his victory emboldens some people – and it only takes one – to commit acts of hatred and violence on their fellow Americans who they perceive as different, separate. But. I am equally dismayed at seeing hateful words and actions come from my own side. In the past year or so, I have often seen the words “love wins” and “unfriend” come from the same person in one post. Confusing, because I have loved ones on both sides of this political divide that is prompting the unfriending epidemic. Confusing, because “unfriend” and love are incompatible. Love is hard work. This is why love is a commandment in spiritual practices, not an option, for extra credit points if you’re flunking Communion or mindfulness. Love is the central mandate (sorry, Leviticus). Back to these United States of America. United? We the people do not resemble that remark right now. The “E Pluribus Unum” (“out of many, one”) on our money is wishful thinking. Our nation has always been fractious, multi-faceted, full of people with different needs. The spirit of compromise that any long-term relationship requires has ebbed and flowed throughout that history, but for the past few years has been lost in all-or-nothing rhetoric tinged with hate. The same amazing technology that brings the entire world into the palms of our hands also makes it possible for our worlds to be more insular than ever before. Smartphones, ATMs, GPS, self-checkout at the supermarket, delivery apps – make it possible for us to find our way around and go about our business without ever having to interact with someone we don’t already know. What’s more, our devices give us something to look at other than another human being. We avoid eye contact and – God forbid! – small talk in line, in the elevator, on the sidewalk or parking lot. It’s so much easier to check those very urgent texts, emails, and instagram-filled news feeds from people in our social circles. Even if those social circles are politically diverse, an algorithm curates the posts that appear, and if the echo chamber it creates isn’t sealed tightly enough, we can further curate the posts: unfollow, unfriend, block. I am guilty of unfollow, if not of unfriend. Ok, if you must unfriend, draw boundaries, I get it. But if you’re also posting about how love wins, remember that the kind of love that excludes one’s enemies – the people you might wish to unfriend – only wins the consolation prize. Why does everything have to be so hard? I wish there were more empathy people of different backgrounds, beliefs, population densities. More rational communication, especially more listening to different points of view. Even points of view that make each other’s skin crawl. That takes courage. I wish there were more courage. I wish I were different. Empathy. Courage. Willingness to listen. I’m a musician. I started out taking “regular” piano lessons as a kid, ie, learning to play from sheet music. Since I’ve branched out into improvising and playing jazz and other styles, every mentor I’ve ever had has told me “listen more.” In any style of music, the silences are as important as the sounds, and playing in a band or any kind of ensemble depends on listening to the other players as much as you’re thinking about what you play yourself. So, to that end, I’m committing to having a conversation a week – via phone or Skype, or in person, not on chat or text – with friends or acquaintances who are 1) people who look like me and have different lifestyles and political beliefs to my own and 2) people who don’t look like me and have similar lifestyles and political beliefs to my own. Not with an agenda or intention of changing anyone’s mind; without a manifesto of my own except as above: courage, empathy for someone whose life is different from mine in some broad way, listening. I have no idea what to expect. I hope I’ll find opportunities to learn and maybe even collaborate, as believe it or not creative people come in all political stripes. At least maybe I’ll get to catch up with some people I haven’t been in touch with for years except with social media tidbits. I’m late. I’m behind on this project for the usual reasons a writer is behind on anything: 1) I’m busy with other Very Important Things 2) I’m terrified. I chuckled ruefully, and my left-leaning heart bled a little extra, especially when I read a comment from one of his friends, remarking on the hateful vitriol coming from people on the left, and the hypocrisy of same. It inspired me to devise a project. The premise of the project is simple: interview acquaintances of various identities and political leanings, and paint a word portrait of them. Create a mosaic of Americans. Or a quilt. Patchwork quilts are quite American. That’s all I know for now. How explicitly political the posts are will vary, by how well I know them, what we end up talking about. Conversation is a priority, conversion is not. I posted on facebook stating my intention with this project back in mid-November (busy, terrified). The uncharacteristically long post received plenty of ego-boosting likes and loves, as well as a couple comments from friends who may agree with my politics but not my approach in this project. As challenging as it is to forge and maintain relationships with people with different identities or opinions from one’s own, giving in to polarization is a tactical error. In such soil grow dictators and corruption. Divide and conquer. Divide, DISTRACT, and conquer. One of the many times I was doubting myself with this project, I read this Washington Post editorial about the rise of Hugo Chávez in Venezuela, and the last three paragraphs in particular resonated and spurred me onward. Turns out I’m rather fond of democracy, now that it’s under threat. Once the dictatorial weeds invade, they’re hard to get rid of. Now seems like a good time to be finding common ground with my fellow Americans, so that we together can demand that our government officials return to being public servants – operative word serve. May they be held accountable for serving a diverse populace and for continuing to strive toward liberty and justice for all. Haiku #387 - Samba Samba Samba! Thank you to the people listed below for their generous contributions to the fundraiser to record a demo for The Sweethearts of Swing! The demo is now up on the website - click here to give it a listen!! There are other wonderful people whose haiku were posted previously - hope you enjoy! you're a rock star now! let's go fill it up! Thanks to Yaremis Felix, Sara Wildavsky, Adam Reich, Gretchen Amstutz, and Shahla Atlas for their generous contributions to the fundraiser to record a demo for The Sweethearts of Swing! The demo is now up on the website - click here to give it a listen!! *in Julie's case, the saxophone! Thanks to Julie Sax for her generous contribution to the fundraiser to record a demo for The Sweethearts of Swing! The demo is now up on the website - click here to give it a listen!! Thanks to Annbritt DuChateau for her generous contribution to the fundraiser to record a demo for The Sweethearts of Swing! The demo is now up on the website - click here to give it a listen!! Thanks to Sherrie Lavelle for her generous contribution to the fundraiser to record a demo for The Sweethearts of Swing! The demo is now up on the website - click here to give it a listen! !